Governor Ricketts with NDVA Director Hilgert, Nebraska MOPH Commander Wade Jensen, and Nebraska Purple Heart veterans at today’s proclamation ceremony. LINCOLN – Today, Governor Pete Ricketts hosted a ceremony at the State Capitol to honor recipients of the Purple Heart medal. 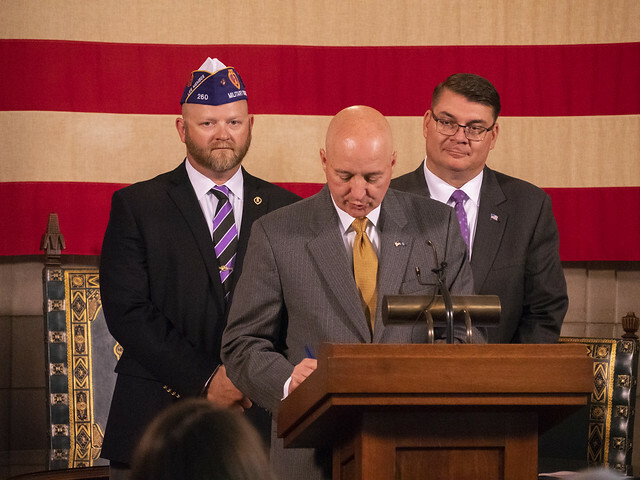 Purple Heart recipients, including members of the Military Order of the Purple Heart (MOPH), were in attendance as Governor Ricketts signed a proclamation declaring it Purple Heart Day in Nebraska. August 7th is Purple Heart Day each year in America. It recognizes those who have been awarded the Purple Heart—soldiers who were wounded or killed in action—and their family members, as well.